Grass sowing device is a good method. Some customers want to know how many square feet is breeding machine spray a day? Spraying square feet is usually affect slope construction process requirements, the coating thickness, water and other materials. General soil spraying construction process need to spray 5-10 cm. As you can see, the difference is great. If you can spray a day 10 cm site 500 square meters, 5 cm can be sprayed with 1000 square meters, 2 cm site to spray an area of 2500 square meters. Material well prepared is also very important, such as: water supply, land supply, adhesive, water, fertilizer, such as convenient water, screening of soil without rock height can increase the work efficiency. If all the materials are well prepared, 8-10 cm, coating thickness is usually a breeding equipment can gush about 600-1000 square meters a day. Usually spray is a case of material need only about 10 minutes, but you have to add water, add soil, mixing, the time of this process. This leads to efficiency is not high. Therefore, in order to spray more quickly, you should be prepared to water, soil, and other materials ready. spray faster, you should prepare water, soil, and other materials ready. As one of the professional hydroseeding machine supplier, high quality hydro seeders are provided. 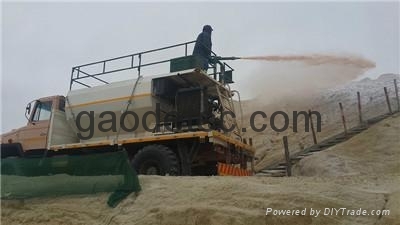 For more information about hot sale low cost hydroseeding machine, please email us: : info@gaodetec.com.